With online shopping growing, and Britons spending a combined £23.1bn in the first quarter of 2014, there has never been a better time for companies to trick us into paying for what we don’t want or need via dark patterns. Fortunately for us consumers a new EU law has just been passed (June 2014) stopping companies from pre-populating checkboxes which add undeclared subscriptions, additional downloads, shipping charges or extra items into our basket. The consumer rights law also prohibits companies from charging minimal amounts for normally expensive products, and then recouping money by charging excessive amounts on processing fees. One example would be a company offering £1 tickets to see a popular band, but then charging £50 to process the order. Recurring memberships or forced continuality is another illegal act now. Unless you have chosen (it needs to be displayed clearly and cannot be pre-chosen or checked) to accept periodic billing for a product or service an EU company cannot charge you. Companies have 2 years to amend websites before the law is enforced, but it’s a step in the right direction at least. One of the main reasons for introducing this updated law across Europe is to convince customers to purchase more cross-country products. Be careful though, as this is only an EU law, so companies in other countries such as the USA or China do not have to abide by the rules. 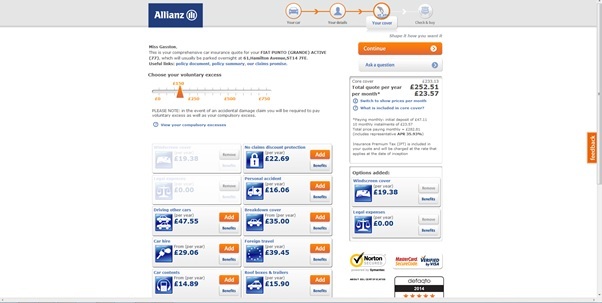 After completing the rigorous task of trying to get a car insurance quote (and providing them with unnecessary required information such as phone number, and email address) an overview page is shown which includes a separate yearly and monthly quote. Within this page there are various different optional add-ons ranging from personal accident cover to roof boxes and trailers cover. So far, so good, some people may want to add these – with the prices being clearly displayed. Adobe Reader is one of the most popular free downloads on the web, downloaded over 61 million times on download.com alone. With more and more PDF’s being uploaded to the web for menus, brochures, ticket downloads and so on, the majority of regular internet users are required to have a PDF reader such as this. 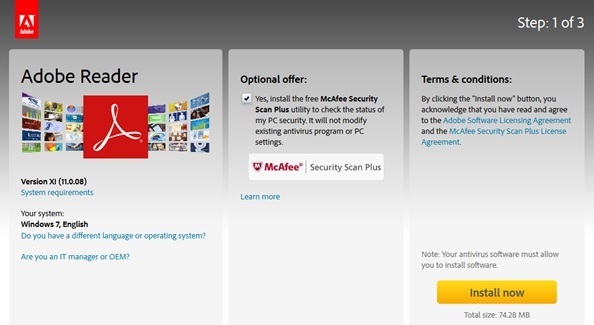 On the UK download page Adobe ‘optional[ly] offer’ customers McAfee Security Scan Plus. This is all well and good, until you notice the checkbox is already ticked when you log onto the page. For customers who don’t have their wits about them they will find they have downloaded this add-on when it’s already been installed onto their machine. Ryanair have long been criticised for over-the-top charges, poor customers service, and not fully informing customers of information they require. Their website is no different. 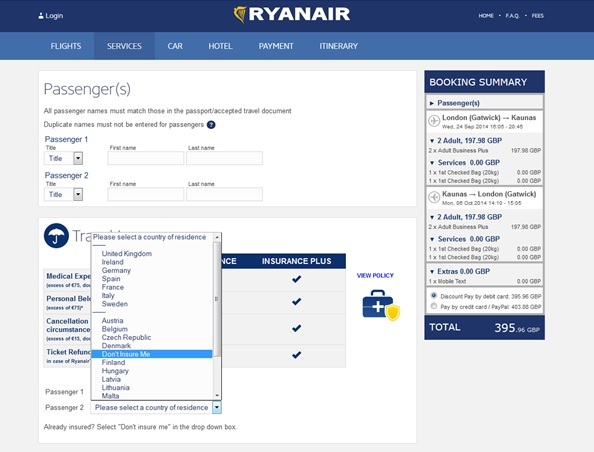 In 2013 Ryanair launched their fresh new website, which looks professional, secure and easy to use. It only takes one search to find plane times and fares from one side of Europe to the other on any dates you select. The problems start showing after you have picked your fare and are on the second stage of checkout, otherwise known as the ‘Services’ page. Here Ryanair offers all customers what is supposed to be optional travel insurance, with a large table showing why you should purchase cover. The select dropdown states ‘Please select a country of residence’ for each passenger, which is a little misleading. For those who don’t wish to be insured you have to navigate to the option titled ‘Don’t Insure Me’ which is located alphabetically between Denmark and Finland. Hopefully this blog post has shown you how deceitfully some of the most well-known and biggest companies operate on the web. And although it is now against the law to implement dark patterns in the EU you still need to be careful, read thoroughly and never just assume companies are being honest. You can read more about the correct ways to operate a business online by reading our step by step guide to ecommerce.